Establishing basic communication skills in students with autism is one of the most important goals of intervention and therapy. Jumpstarting Communication Skills in Children with Autism helps explain strategies for parents to do just that in an Applied Verbal Behavior method. 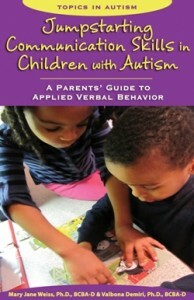 Providing an accessible understanding of Applied Verbal Behavior (AVB) for parents, Jumpstarting Communication Skills in Children with Autism presents strategies for improving children’s understanding of both verbal and nonverbal communication to improve expressive abilities. With an overview of language development, the authors offer practical strategies to address issues such as making requests, perseverative speech, lack of fluency in conversation, and trouble reading others’ signals. Other strategies profiled are PECS, sign language, video modeling, scripts, and social stories. This week only, Jumpstarting Communication Skills in Children with Autism is being offered at a 15% discount. Simply enter the Promo Code BLOGJSCS6 at checkout to redeem your savings. *Offer expires on September 18, 2012 at 11:59 pm EST. Not compatible with any other offer. Be sure there are no spaces after the Promo Code when you enter it at checkout. Written by: Different Roads to Learning on September 11, 2012. This entry was posted in ABA, autistic spectrum disorder, Difflearn Promo Code, Pick of the Week, Speech & Language and tagged ABA, Applied Behavior Analysis, autism education, autistic spectrum disorder, conversational skills, language development, learning, teaching tools by Different Roads to Learning. Bookmark the permalink.